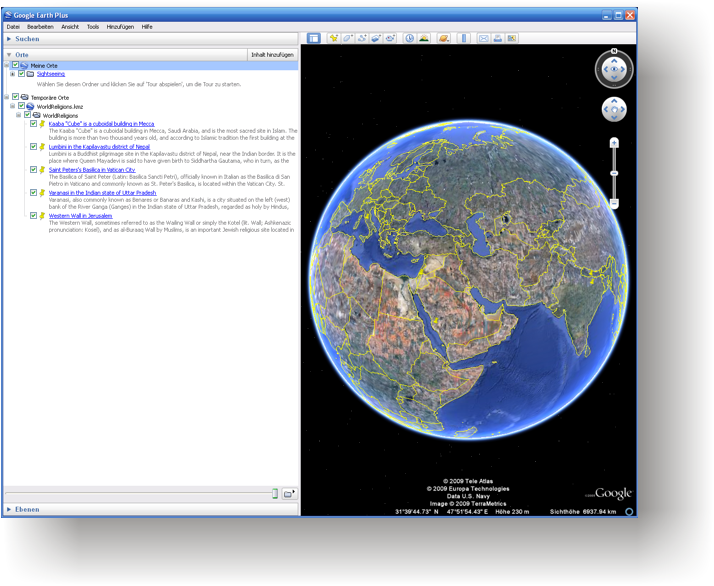 The Google Earth is an excellent tool to define and to save the particular waypoints and routes. From this site you can download the waypoint .KMZ files of Google Earth. The .KMZ contains the locations of holy places around of the world. To get the waypoints into the destination data bank in the TerraTrack Recorder 7 download the .KMZ file, copy it to your Windows phone, start the TerraTrack Recorder 7 and open the file. The waypoints will be recorded in the data bank. It is good practice to get some locations used the Google Earth or Google Maps, because it works with the TerraTrack Recorder 7 automatically (just open the .KMZ or .KML file and you get it). After copying of the world’s holy places into our Windows phone we may select a certain point as destination and determine the accurate bearing and the distance to the point. Something Muslims might appreciate. All Muslims around the world face towards the Kaaba in Mecca during prayers, no matter where they are. The Kaaba "Cube" is a cuboidal building in Mecca, Saudi Arabia, and is the most sacred site in Islam. The building is more than two thousand years old, and according to Islamic tradition the first building at the site was built by Abraham (Ibrahim). The building has a mosque built around it, the Masjid al-Haram. All Muslims around the world face towards the Kaaba during prayers, no matter where they are. Lumbini is a Buddhist pilgrimage site in the Kapilavastu district of Nepal, near the Indian border. It is the place where Queen Mayadevi is said to have given birth to Siddhartha Gautama, who in turn, as the Buddha Gautama, gave birth to the Buddhist tradition. The Buddha lived between roughly 563 and 483 BCE. Lumbini is one of four magnets for pilgrimage that sprang up in places pivotal to the life of the Buddha, the others being at Kushinagar, Bodh Gaya, and Sarnath. The Basilica of Saint Peter (Latin: Basilica Sancti Petri), officially known in Italian as the Basilica di San Pietro in Vaticano and commonly known as St. Peter's Basilica, is located within the Vatican City. St. Peter's has the largest interior of any Christian church in the world, holding 60,000 people. It is regarded as one of the holiest Christian sites and has been described as "holding a unique position in the Christian world" and as "the greatest of all churches of Christendom". Varanasi, also commonly known as Benares or Banaras and Kashi, is a city situated on the left (west) bank of the River Ganga (Ganges) in the Indian state of Uttar Pradesh, regarded as holy by Hindus, Buddhists, Jains, and Senthoo. It is one of the oldest continually inhabited cities in the world. The Western Wall, sometimes referred to as the Wailing Wall or simply the Kotel (lit. Wall; Ashkenazic pronunciation: Kosel), and as al-Buraaq Wall by Muslims, is an important Jewish religious site located in the Old City of Jerusalem. Just over half the wall, including its 17 courses located below street level, dates from the end of the Second Temple period, being constructed around 19 BCE by Herod the Great. The remaining layers were added from the 7th century onwards.